This type of salt comes in many varieties and grain sizes, enhanced with iodine at the rate stipulated by the national legislation, as per case. 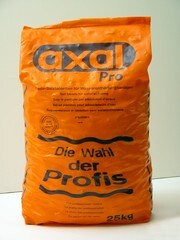 Packaging : 10Kg, 25Kg, 30Kg bags, big bag. An especially processed highly pure product, which derives from the recrystallization of purified brine. Major applications: Clothes dyeing, tanneries, chemicals, plastics, water treatment, condiments, food preservation, bakery industry, meat production, processed meat products, spices, cereals, cheese, pharmaceutical applications, various household uses. Esco salt tablets for water softening purposes have been developed particularly for application in water softening installations, as for example in private homes, hotels and restaurants, hospitals, laundries, etc. Made of high-purity vacuum salt, esco salt tablets dissolve easily and completely, and are absolutely residue-free. They help to regenerate the ion exchange unit and prevent it from furring up (calcification), thus guaranteeing the proper operation of the ion exchange unit. We dispose salt products for: food industries, bakery, pickles, olive processing, salted nuts, canning, sausage, meet processing, health food, poultry, animal feed, dyeing industries, water softening, tanneries, de-icing roads, salt industries and further processing, chemicals, fertilizers, water treatment in hotels, hospitals etc, soaps and detergents production, paper processing, pharmaceutical applications, bath salts and many more.